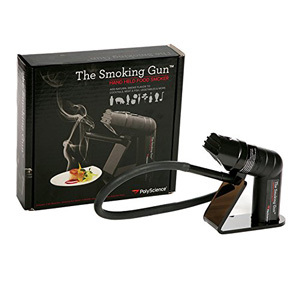 Handheld smoking guns are the easiest and most cost effective way to add a touch of flavor to any dish. Traditional smokers are costly and can take up a lot of space, but with a handheld smoking gun you can get the same type of effect at a fraction of the cost and time. Of note, these handheld options are for cold smoking only and do not actually cook the food as in some hot smokers. So you will need to cook the food separately unless it’s a raw preparation. There’s really only one good brand on the market and that is the Polyscience The Smoking Hand Gun. Polyscience is a leader in the production of equipment for the modernist cook. Check out my reviews of their immersion circulators here. The Smoking Gun is very easy to use and requires no other special equipment besides the wood chips you desire and a lighter to ignite them. You just cover the food to be smoked with plastic wrap, insert the smoking tube under the plastic wrap, and light the desired wood chips. In minutes, you’ll have a smoky flavor infused into the food or beverage you are smoking. There are really only two drawbacks I’ll note. First, the smoker produces a lot of smoke (which it is supposed to do) so you may want to open a window or use your hood ventilator over the oven to more quickly dissipate it. The second is that the Polyscience wood chips are pretty expensive so you should buy a cheaper variety and then if necessary, grind it in a spice grinder to get small enough pieces for the Smoking Hand Gun. It runs on 4 AA batteries that last a very long time under normal at home use. It’s pretty small at about 10 inches and weighs only 1.5 pounds. Overall, I definitely recommend the Polyscience Smoking Hand Gun for anyone who wants to add a new depth of flavor to their food or drink – Find it here for under $100. But as noted above, don’t buy the Polyscience chips, click here for a cheaper options that gives the same level of quality.